"The photography of the past displayed families and wedding parties lined up, almost robotically"..
Over the past decade we have seen wedding photography become so much more than just a posed picture. It has become one of the most important aspects to any couple's wedding. The photography of the past displayed families and wedding parties lined up, almost robotically, in rows of two or three displaying strained smiles with hands and elbows strategically placed on partners shoulders "just so" - this style of photography has thankfully become cliché and outdated. Today, brides are now aspiring to incorporate a more modern and contemporary style of photography into their weddings - often referred to as candid or photojournalistic. This style reflects a more relaxed approach to capturing the day's events as they unfold - illustrating a more fun, easy, 'joie de vivre' style resulting in visual storytelling with a fresh and elegant spin. 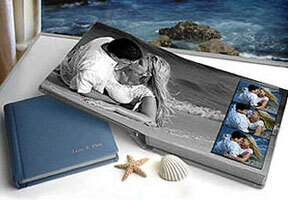 These are a fabulous new alternative to the classic wedding photo album. A couple can select their favorite photos from the wedding and have them professionally printed and bound into their very own coffe-table book to be displayed around the house to be enjoyed for years to come. When this concept was first introduced to the market ten years ago, it was considered a very elite, elusive option for only those who had $10,000.00 or more to spend on wedding photography alone, but thanks to increased competition and more cost effective printing processes it has become a far more obtainable option for couples ranging in prices from $1,000.00 to $5,000.00. Couples again choose their favorite photos to be presented in a slideshow format on a DVD. It's a wonderful way to sit back and view your photos effortlessly on your flat screen TV with family and friends... most often set to music. This service is not often a deal maker for couples as many computer savvy individuals are more than capable of taking on this task themselves in creating their own slideshow set to music, but for those so inclined it can be a great keepsake and a fun one at that to view with ease time and time again. The choices have now become even more complex as a couple now have the option to have their wedding shot digitally or with traditional film. Depending of which photographer you are talking to both positive and negative comments can be heard about each. Film is said to best capture that flawless, classic elegance many couples are drawn to while digital is more often referred to as the more fun and trendy option - and despite common misconception, not necessarily a less costly one. Production-wise more work tends to go into digital photography after the fact as images need to be cleaned up, adjusted and manipulated whereby film is what it is... beauty captured in a blink of an eye (hence why when going with film a more experienced photographer is a good idea). In the end, look for a photographer that is confident in their choice of media, whatever it may be. That is how a couple can best ensure happy end results. This style of negative allows for images to be blown up to poster size or larger while still maintaining the most definitive of details. This an appealing option to couples that wish to "make art" out of their wedding photographs to be displayed proudly and stylishly on the walls of their homes. This type of negative makes for crystal clean images unmatched by standard size negatives. It's hard to define this "offer" as a perk per se, but it certainly is one that is truly definitive of encapsulating "the Art of Wedding Photography" in exquisite fashion. A concept that isn't really innovative as much as it is convenient, hiring a company that boasts two photographers is becoming more and more popular these days. The draw tends to be the ability of the photographers to split up and spend time with each side of the wedding party prior to the ceremony - often the guys with the male photographer and the girls with the female photographer. This allows a couple to maximize their time with the photographer as well as capture different styles of images as every photographer tends to have his/her own approach to snapping that perfect shot. Make note that an assistant is not a 2nd shooter and should not be confused as one. Geneve McNally is one of two Principal Planners of DreamGroup Productions Wedding & Event Planners in Vancouver, BC. Geneve and her business partner, Sarah Shore, created DreamGroup in the Summer of 2004 and now represent one of the top planning companies in the city executing over 60 weddings and special events annually. In her "spare" time Geneve teaches Wedding Planning at Vancouver Community College and also writes for several local publications. She is happily married and the proud mother of two year old son, Harrison Law.